To see Dustin Johnson grip the club, you wouldn’t peg him as a world-class player. Not only are his hands in a much stronger position than most pros’, his right thumb wraps around the handle as though he’s holding a baseball bat. 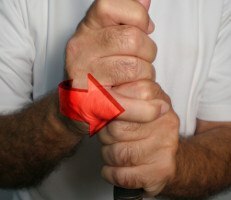 (This is sometimes called a “short thumb” grip.) His palms appear to have much more influence over the club than his fingers, another unusual feature. There’s a method to Johnson’s apparent madness, however. He has huge hands which could easily become overactive during the swing. By holding the club more in his palms, Johnson limits his hand action and curtails a natural tendency – exacerbated by his tremendous strength and flexibility – to hit massive hooks. The 6’4” athlete is best known for his prodigious driving distance, but he’s an underrated putter. On the greens, Dustin Johnson’s grip is – believe it or not – quite conventional. The only slight oddity in his reverse-overlap grip is a right hand that’s a little stronger than his neutral left. 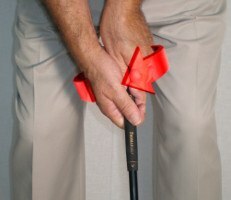 In other words, his right hand is turned slightly away from the target, underneath the handle. 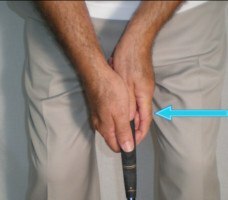 This likely helps Johnson release the putter at impact and into the follow-through, preventing pushed putts and creating a true roll.